For such a small nation, New Zealand has produced a surprising number of great achievers, famous in a wide spectrum of endeavours and deserving of their prominence and respect in the eyes of fellow New Zealanders and the rest of the world. The full set of six stamps. These stamps were issued with small removable tabs next to each stamp. (See the set of stamps above.) Each tab measured 10mm x 30mm. These tabs were perforated like the stamps and carried the promotional message 'Stamp Month October 1995'. These tabs were for a special promotional offer - customers could collect 10 tear-tabs and send them in (affixed to an entry card) to receive a souvenir card in return. 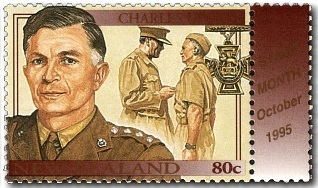 With the exception of the British Royal Family, persons featuring on New Zealand stamps, until 1995, had done so posthumously. For the first time in New Zealand history, this policy was widened to include living celebrities. Ninety thousand votes were received and after the votes were counted, a nationwide unveiling was announced on a popular television show - the Holmes programme - on 3 October at 7.00pm. The results and stamps are:- 40c Performing Arts - Dame Kiri Te Kanawa; 80c Service, Business and Development - Charles Upham VC; $1.00 Fine Arts and Literature - Barry Crump; $1.20 Science, Medicine and Education - Sir Brian Barratt-Boyes; $1.50 Community Leaders and Social Campaigners - Dame Whina Cooper; $1.80 Sport - Sir Richard Hadlee. 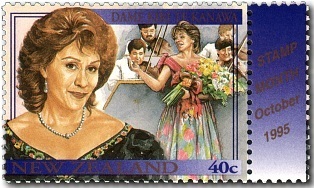 Dame Kiri Te Kanawa - Born 6 March 1944. The stunning voice of Dame Kiri Te Kanawa has brought her fame in all major opera houses throughout the world. In addition to her wide operatic repertoire, she regularly includes songs from well-known popular musical shows and Māori music adding to such songs her special gracefulness and majesty. Her rise into prominence began with placings in both the Mobil Song Quest and the Melbourne Sun Aria before gaining a Queen Elizabeth II Arts Council grant to study at the London Opera Centre in 1966. She was awarded a Dame of the Order of the British Empire in 1982. Charles Upham VC - Born 21 September 1908, Died 22 November 1994. Charles Upham won his first Victoria Cross for bravery fighting for his country in Crete in 1941; the second in North Africa for heroism against Rommel's German forces the following year. Captain Upham was captured and finally, owing to his repeated efforts to escape, was transferred to the high security of Colditz Castle where he remained until 1945. After the war, a reluctant hero who disliked publicity, he was happiest in the privacy of his North Canterbury farm. Barry Crump - Born 15 May 1935, Died 3 July 1996. 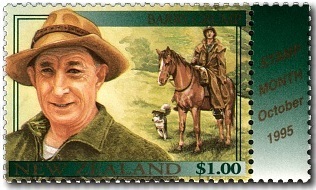 A man with more than 20 highly successful books to his name, Barry Crump wrote his first, A Good Keen Man, back in 1960 and has enjoyed the well-earned reputation of being a 'real Kiwi bloke', a man's man, who could tell a great yarn with humour and unique down-to-earth style. He has always been a lover of the outdoors and much of the material in that first book was from his experiences as a pig and deer hunter living life to the full and loving it that way. Sir Brian Barratt-Boyes - Born 13 January 1924, Died 8 March 2006. 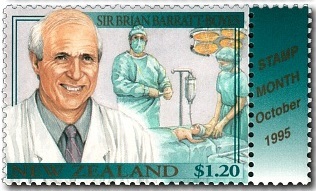 Sir Brian Barratt-Boyes, internationally renowned heart surgeon, pioneered new surgical techniques which have earned him the highest respect from peers and patients alike. He made history by developing techniques to replace defective heart valves, which attracted immense overseas attention and brought many patients to New Zealand. He also found new ways to treat babies born with heart defects. His work put Greenlane Hospital, Auckland, at the forefront of heart surgery. He held the post of Head of the hospital's Heart Surgery Unit for almost a quarter of a century. He was knighted at the age of 47 for his contribution to heart surgery. Dame Whina Cooper - Born 9 December 1895, Died 26 March 1994. Dame Whina Cooper was in her hundredth year when she passed away in 1994. For more than 60 years she had worked tirelessly to create and maintain harmony between New Zealand's two races, always striving to find peaceful solutions to differences of culture and situation. She had immense prestige among her people and was called Whaea O Te Motu (Mother of the Nation). Europeans remember her best for leading 5,000 people on a 1,100km walk to Parliament in 1975 to highlight Māori grievances. She was awarded a Dame of the Order of the British Empire in 1980 and admitted to the Order of New Zealand in 1991. She is recalled as saying at her investiture - "They did not understand that I would have more power to fight for them and all Māori people. 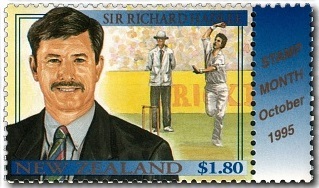 Sir Richard Hadlee - Born 3 July 1951. High profile, high achieving cricketer, Sir Richard Hadlee was not only a great bowler but also a distinguished batsman and fielder. When he retired in 1990 he had taken 431 test wickets, made 3,124 test runs and taken numerous catches. He played for Nottinghamshire from 1978 to 1987 and New Zealand from 1973 to 1990. His best test performance was in Brisbane in 1985 when he took 9 Australian second innings wickets for 52 runs. In the 1980's, the golden period of New Zealand cricket, Hadlee was the quick new-ball spearhead of the New Zealand attack and many an opponent was demoralised and promptly dismissed by his relentless talents. He was knighted in 1990. 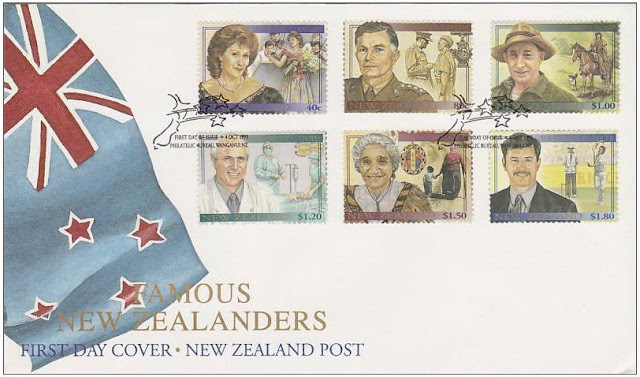 A Famous New Zealanders first day cover with all six stamps affixed. A Famous New Zealanders presentation pack. The First Day Cover - 4 October 1995. 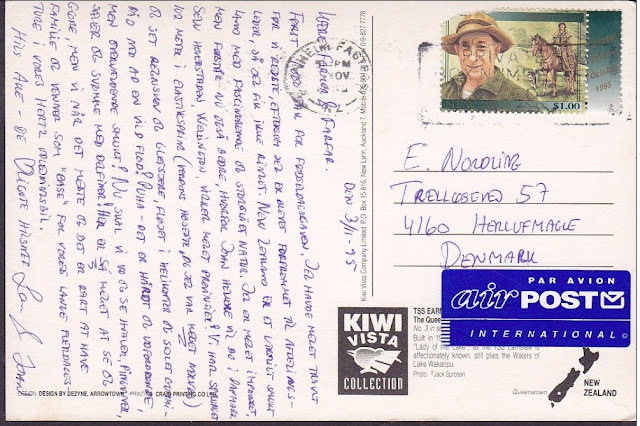 A postcard sent back to Denmark by a tourist showing one of the stamps from this issue. Back with $1.00 Barry Crump. 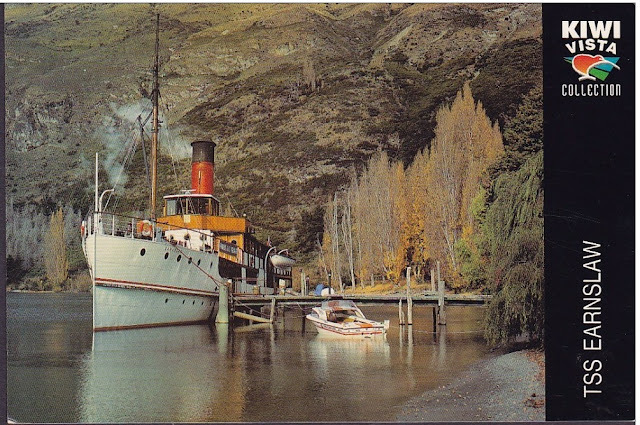 Front showing TSS Earnslaw on Lake Wakatipu. Date of issue: 4 October 1995. Stamps and first-day cover designed: Karen Odiam, Wellington, New Zealand. The number of stamps: Six. Denominations and categories: 40c Performing Arts; 80c Service, Business and Development; $1.00 Fine Arts and Literature; $1.20 Science, Medicine and Education; $1.50 Community Leaders and Social Campaigners; $1.80 Sport. Stamp size and format: 42mm x 30mm (horizontal). The number of stamps per sheet: 100. Period of sale: These stamps remained on sale until 4 October 1996. 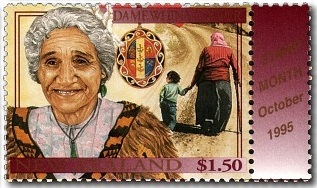 Good to see Dame Whina Cooper appearing on a stamp. I noticed you have included this in you Index on Things Maori.